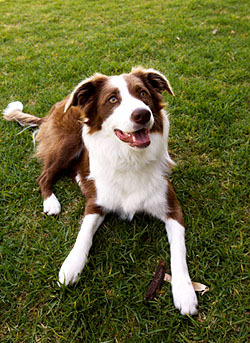 THPRD offers an abundance of opportunities for the community to exercise their dogs. UPDATED: In April 2018, given the increasing interest and scope on the topic of THPRD dog parks, staff engaged the Parks & Facilities Advisory Committee (PFAC) to help review our current policy and practices, listen to public input, analyze what other agencies are doing, and make recommendations to staff for the development of a long-term strategy. In January 2018, staff received the committee's recommendations and began developing criteria and considerations for inclusion in the Parks Functional Plan. For a summary of the recommendations please click here. Please note that these are recommendations and are subject to further review and adjustment. THPRD's 200+ park sites, 90 of them with recreational amenities, offer an abundance of opportunities for the community to exercise their dogs. For the protection of wildlife, pets are not allowed within the Tualatin Hills Nature Park or Cooper Mountain Nature Park. All dogs are required to be on leash and under control by their owners while visiting park district property. THPRD's dog parks are open dawn to dusk, seven days a week. Note: the parks at Winkelman and PCC have grass enclosures that close during winter months; the all-season areas remain open year-round at both locations. To ensure that our parks are sanitary as well as safe, we require that patrons remove any solid waste contributed by their dog(s). The designated off-leash dog area at Aloha's Hazeldale Dog Park is the district's oldest dog park. It is located at SW 192nd and Prospect Place, at the south end of the park. The fenced-in park spans two acres and is divided into sections for large, medium, and small dogs. Amenities include benches, disposal bags, and a water fountain. The surface is grass and dirt. The Hazeldale Dog Park is the site of numerous canine-oriented events. Dates and times of these events will be posted on this page. Hazeldale Dog Park is maintained by THPRD and run by volunteers. To contact the volunteer group that runs the dog park, e-mail hazeldaledogpark.aloha@yahoo.com. Established in 2013, the Winkelman Park site (10139 SW 175th Ave.) is located on the east slope of Aloha's Cooper Mountain. It features a two-acre dog park adjacent to a multi-purpose youth athletic field. THPRD will eventually add a community garden, sheltered picnic seating, play areas, and more to the site. The park includes an all-season area, as well as separate fenced areas for large and small dogs. Only the all-season area is open year-round; the remaining areas are open from approximately April1 to Nov. 1 each year. Amenities include an agility area, with jump walls and weave poles. A paw wash and pet drinking fountain also is provided. This 1.7-acre off-leash area opened in September 2013. 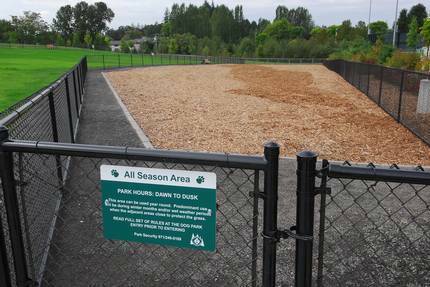 The park includes a small dog paddock, a winter paddock with wood chips for use during the wet season, and a large, sloped area. Only the winter paddock is open year-round, with the remaining areas open from approximately April1 to Nov. 1 each year. The site includes benches, a water fountain, a concrete entry and a chain link fence. 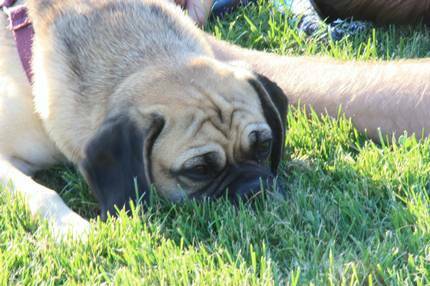 Parking spots have been designated for dog park users. To review a listing of other great THPRD parks where you can walk your dogs, click here. For more information on THPRD dog parks, contact Keith Watson at kwatson@thprd.org. THPRD may post the exclusion of domestic animals from designated park sites during special events, when overcrowding or activities may limit the enjoyment or safety of others. Dogs are prohibited in park areas designated as no-dog areas, except guide dogs per ORS 346. A dog brought into or kept in other park areas shall be on a leash not more than eight feet in length, or confined in a vehicle, and must be kept under control at all times. Dog owners are responsible for the immediate removal of all solid waste deposited on any park property. Dog waste disposal bags can be found on the rules and regulations posts at most THPRD parks. If you have any questions regarding the dog waste bags, please call the THPRD Maintenance Operations office at 503-629-6360.